Zanu-PF will have to meet soon to review the status accorded to former President Mr Robert Mugabe following his political activities that saw him being involved in the formation of a new opposition political outfit, the National Patriotic Front (NPF), a senior party official said yesterday. Zanu-PF secretary for Legal Affairs, Cde Paul Mangwana, said in an interview that the former President risked losing Zanu-PF membership, constitutional privileges and respect for dabbling in opposition politics. A fortnight ago, Mr Mugabe met Brigadier General Ambrose Mutinhiri (Retired), who fronts the NPF, at his Blue Roof mansion in Borrowdale, Harare, where they discussed the formation of the party, an outfit drawing membership mainly from members of the G40 cabal. Cde Mangwana said the national constitution does not allow a former Head of State to dabble in active politics. He said Zanu-PF would have to meet to consider Mr Mugabe’s legal status in light of the new development where he was involving in opposition politics and issuing statements that cast aspersions on the new dispensation led by President Emmerson Mnangagwa. Last week, Mr Mugabe told a selected group of local and foreign journalists that the new Government led by President Mnangagwa was illegitimate, despite the fact that he tendered a resignation ahead of an impeachment on November 21 last year. This subsequently saw the Zanu-PF Extraordinary Congress replacing him with President Mnangagwa. Cde Mangwana said Mr Mugabe risked losing membership and the privileges he was enjoying. “In the fullness of time, Zanu-PF will have to meet to discuss these new developments about the former Head of State and Government to review whether it is still necessary or not for him to continue enjoying the status we had given him,” he said. “Ordinarily, a former President should play a father figure role and should not join active politics, particularly opposition politics. Asked if Mr Mugabe was not allowed to exercise his right to freedom of association by supporting a political party of his choice, Cde Mangwana said the Constitution had to be read holistically. “There are no absolute rights,” he said. Zanu-PF secretary for information and publicity Cde Simon Khaya Moyo said President Mnangagwa had made a pronouncement regarding the conduct of Mr Mugabe. “A few days ago, His Excellency President Mnangagwa was clear regarding that issue,” said Cde Khaya Moyo, who is also acting Minister of Media, Information and Broadcasting Services. President Mnangagwa said Mr Mugabe was “entitled to express himself freely as is the case for any private citizen”, but he should realise the nation had since moved on. Zanu-PF Matabeleland North provincial chairperson, Cde Richard Moyo, said Mr Mugabe had destroyed the 37 year legacy that he had built by hobnobbing with opposition politics. Masvingo provincial chairperson Cde Ezra Chadzamira said the province was surprised by Mr Mugabe’s conduct. 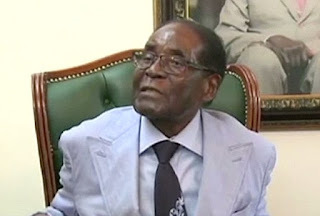 In his interview, Mr Mugabe was quoted as saying while he might not have links with NPF, he will support the opposition party if it promoted what he said “the ruling party’s values”. “My view is that if they think that the new party will represent the people better, that it will be democratic and avoid hypocrisy and falsehoods that are now characterising our government, and appealing to people in an honest way, I will support that,” he said.